Firefighters, inspectors and paramedics protest for pay and benefits Thursday outside Florida's Kennedy Space Center. Drastic cuts to NASA's budget are threatening pay and benefits for Kennedy Space Center's fire and rescue personnel, workers said Thursday, sparking a union protest outside the space center. “We are here today to send a very poignant message to both the company G4S and NASA to keep their hands off what the fireman have already earned,” said Kevin Smith, president of Transport Workers Union Local 525. The union represents workers for G4S Government Solutions, formerly Wackenhut. It took over NASA's fire and rescue contract at Kennedy Space Center eight months ago. The workers are negotiating a new contract, which is to begin in December. During the first year of its contract, G4S agreed that salaries and benefits would remain unchanged. But now, fire and rescue workers say the company wants to cut pay by 20% and eliminate the workers' pension plan. NASA spokesman Mike Curie told CNN, "no new employees will be covered under the previous pension plan," going forward. "G4S is attempting to negotiate a 401k plan with the union." Curie also said that "under the Kennedy protective service contract, workers who are covered under the previous contract benefit plan are not losing any benefits." The protest comes more than a year after NASA ended its 30-year space shuttle program and the loss of thousands of related jobs throughout Florida's Space Coast. “We continue to work toward a successful resolution, recognizing that both the mission and the budget of the Kennedy Space Center has changed drastically in the past year," said Susan Pitcher, executive assistant with G4S Government Solutions, in a written statement to CNN. Kennedy Space Center and the surrounding aerospace industry is vitally important to Florida's economy, with 86,000 workers and generating more than $4 billion in annual revenue, according to Florida Lt. Gov. Jennifer Carroll. G4S employs 90 firefighters, paramedics and inspectors, who provide emergency services at Kennedy Space Center. Union president Smith said NASA should have known G4S would have not been able to provide the same level of service without the work force making huge concessions. Emergency services at the space center won’t be interrupted during the protests, workers said. G4S provides security, firefighting and emergency services at several NASA sites, such as the Jet Propulsion Laboratory , NASA Ames Research Center in California's Silicon Valley and Houston's Johnson Space Center, said Pitcher. Each facility has a separate contract, and none is related to the agreement at Kennedy Space Center. yup.......the gravy train has come to a sudden stop. BeforeI make any judgement for either side I would like to see some basic facts. How many calls for service does the FD, EMS & Security receive each month / year? What are they doing when they are not answering calls? What is their annual pay? What is the amount of hours they are on duty each week? What other benefits are they receiving? For example free meals while on duty? Not making any statement for or against, but would like some answers. Scott... our call volume is steady, however less than most municipal departments due to the lack of residential neighborhoods. We maintain NFPA minimum manning requirements to assure proper manpower in the event of a fire. We train in our various specialties during down time, and also review fire pre-plans for facilities throughout the space center annually – usually several buildings a day. We are responsible for testing all hydrants on the facility annually. We definitely stay very active during the day. We work 24 hours on, and 48 hours off, so we live at KSC for 1/3 of our lives. Our pay is comparable to surrounding departments, and is about half that of most engineers on center (not complaining, just giving you an idea of our pay). We have medical insurance. We HAD a pension... and I can only hope that we can get it back. No free meals, we bring our own food. Now that the details are out of the way... the most important part of what we do – is making a difference. We have saved numerous workers lives on center, and I have to say that it really fires me up when I have to beg and stand in a protest every day in an effort just to save my retirement! We are not getting rich sitting in our fire stations every day. We are only asking to continue the SAME benefits. Some say that we don't get paid for the hours spent without a call, but for the several minutes that we put our own lives at risk or work under unbelievable pressure to save a stranger's life. Pedro is able to work because of I started his heart back up after he got electrocuted. Jessie breathes and enjoys his life and family because I put a laryngoscope down his throat to pull the food out of his airway. Andrew is not pushing up daisies because of me. I'm not trying to sensationalize what we do, but – unlike most careers – I make a difference and am personally willing to risk everything to save people without hesitation or even a second thought. I kiss my wife and kids goodbye, and we are all acutely aware that there is a chance I won't come home. I have had two friends die in this profession. G4S... just give us the benefits that we've had for years before your crappy company got awarded a contract you couldn't afford to run. NASA... restore our pension and let us feel that we have a secure future for our service. The question I want to have answered is how much work is there now that the shuttles are no longer flying. From what I have been told there were something like 10,000 workers let go. Then the Constellation program has been canceled. So there are no NASA rockets flying astronauts for years. The SLS program is still in it early years and that rocket won't fly until 2016 or 2017. From where I sit welcome to my world. I have worked in tech for over 20 years. I have no retirement benefits. No pension. No medical. A very shaky underfunded 401K. 3 business I worked for that tanked. As a tax payer I am not so sympathetic to keep you employed at the level you once were at considering the KSC is a bit of a ghost town right now. You're lucky you have powerful congress people and you're part of the space states or you wouldn't even have a job right now. Thomas. If younknew what you were talking about, you would know that the Fire Fighters accepted the 401k as a replacement plan. The problem is the company changed their mind and offered ZERO as a replacement. Why, I repeat, Why are emergency services like Fire and Medical being contracted to Mall Cops. These polyester wanna-bees can't keep senior citizens from littering, never mind run a force that is designed and charged with protection multi- billion dollar science facilities and space ports. They may have contracted it to the mall cops, but the actual workers will stay the same for the most part. The government would have chose the company based on "value to the government" which basically means who will do it cheapest. Then in order to do it cheapest, they try to cut the pay and benefits of the workers. The workers get no say in this process. They are basically given to whoever wins the contract. We are NOT "Mall cops". ALL of us have many years of firefighting experience and are college educated. We are NOT "wanna be's" either! If people would just STOP and talk with the firefighters involved you would be getting ALOT more information than what is being written in a few sentences!! Next time you need emergency services....especially when your home with your loved ones, THINK AGAIN who steps off of those emergency vehicles the next time you need them. All I can tell you all is get ready for a layoff NASA Michoud in New Orleans did the same thing to the firefighters and protective service contractors when Coastal Intenational Security took over the contract. The fire department is now under contract with the city of New Orleans fire department. No one was able to transfer, Good Luck! NASA has very little control over how contractors execute their contracts, as long as they're following the constraints in the contract. They can take some blame there, but not all of it. 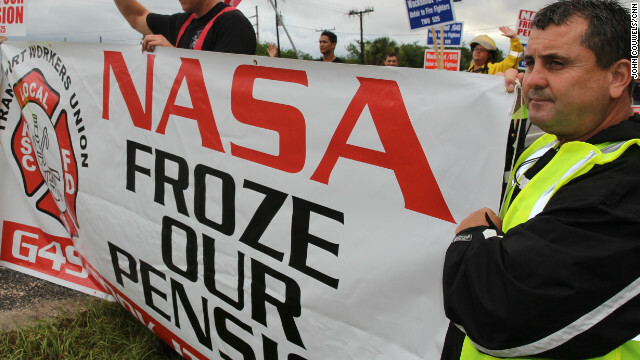 The only reason that NASA's name is in any of this protest, is that the KSC firefighters pension – funded by NASA (not contractors) for 30+ years – was frozen by NASA earlier this year. This is independent of anything done by G4S. Wait...wasn't it the Obama Administration that slashed the NASA budget to begin with? Don't blame the failure on big business, people should be asking the Big O for reasons why the program was hung out to dry to begin with. Well it was actually Bush who put the Shuttle program out of commission and Obama funded two more launches. Bush is the one who under funded the Constellation program so much that it was years behind schedule. Not that I'm a huge Obama fan but he was there to pick up the pieces from an already failing new program. No Bush funded it fine, NASAmismanaged the program. G4S pulled the same bait-and-switch tactics to get the Olympic Games security contract... bid low, to be sure and get the contract – then cry poor and take the slap on the wrist for screwing up. They get the money, but don't produce what the contract called for. It's also a bold face lie on behalf of Mr. Curie to say that firefighters which worked under the previous contract will not lose any benefits... Taking away our pension and replacing it with a 401k (with a 3% match by G4S) is ridiculous and does not compare. Doubling our health insurance costs is a loss of benefits. Taking away our voluntary medical retirement plan is a loss of benefits. We didn't want a raise... we only want what we had. In this and other conversations related to the picketing at the Space Center, I've seen union guys refer to 401k plans as if they are some kind of punishment. Guess what? That's what those of us that operate in the private business world have been receiving for years. If you want a comfortable retirement, Fire Guys, start saving your money and putting it into your plan like the rest of us. I have no sympathy for your losing all of the free money you've been receiving in past years in the form of a “pension”. Just because your lucrative union contracts gave it to you in the past does not mean you deserve it or that its warranted...or that companies can even afford to offer it to you. Take a look at the economy right now…at all the other Americans that would be GRATEFUL to just have a job, and consider yourself lucky that you have an income and at least SOME benefits coming into your household. I’ve seen the union picket lines at Kennedy Space Center, and I note that every last one of the guys standing out there have beer bellies. You are a bunch of greedy, lazy guys. Are you for real?! The majority of firefighters here routinely run for miles, and as for the beer bellies – they still tow the line. Your unsympathetic view of the loss of our retirement is fortunately a minority. As I am aware , a 401k is the standard retirement for many private sector employees, and is not any form of a punishment. Getting our pension FROZEN and starting at zero is a load of crap. We're not making loads of money jerkwad. We're making a modest living and our hazardous job deserves a solid future. Next time you wrap your car around a pole, or choke on your cheesesteak in the cafeteria, we'll be there to save your cranky existence so you can live to lash out again at the workers that keep you safe every day. STOP on by Thomas.....at ANY fire station out there and get ALL the facts. Don't ever let the "beer bellies" fool you either. We would VERY much like to have a 401K that we can contribute to as well. I for one, would like to KEEP what I have earned over the last 21 years at Kennedy!!!!!! How would you like it if a new company OR NASA came to you and said....well, we're gonna have to cut your pay by 20%-30%, eliminate the 401K that you have been contributing to since you've been here, increase your health insurance over 50%, and pretty much take away EVERY OTHER benefit you EARNED FOR ALL THOSE YEARS YOU WORKED!!!!! Bet you wouldn't be sitting there saying..." geez, thank you very much! If you want...I'll even pay you (NASA or the company) to work here"!!!!! I guess after being in the fire service for 30 years this is how its suppose to be!!? Oh yeah...been doing it since I was 19.....so after 30years I'm still to young to retire. So don't even go and say..."just retire". Why don't you support the firefighters instead of bashing them? They NEVER did anything to you.....except be there 24/7/365 for YOU and EVRYONE ELSE OUT THERE. I'll bet three quarters of the people out there HAVE NO CLUE what the firefighters and medics do, OR what we HAVE DONE in the past!!!!!! It's a sign of the times. Everyone is having to make do with less. Well, except big business, the oil companies, Bill Gates and his buddies, etc. But the REST of us have to make do with less. Get used to the idea cuz it ain't going to go away any time soon. What Mr. Curie is saying is cute play on words. He say's 'workers who are covered under the current benefit plan are not losing any benefits" If had had been asked "Will they lose those benefits in 3 months" I wonder what his answer would have been. We never said we have lost all of our benefits yet......we are GOING to lose them if the contractor stays with their current proposals. It's as simple as this. NASA knows what is going on and knows full well the contract value can't afford to keep the employees covered with good benefits as they are now. If NASA cared, they intervene now and rectify this situation. If they don't care, they will continue to keep their heads buried in the sand. It is about NASA caring it is about funds. The shuttles required a small army of people to keep the flying. The program is over the shuttles are done. The SLS is still years away and I doubt it will ever actually fly. Why should tax payers in the rest of the states not named Florida have to pony up money to keep people employed when there really doesn't seem to be the need there once was. Welcome to my world of private industry. We have no pensions and no retirement health care. 401K's will all crash once the baby boomers start taking more money out then they are currently putting in. Your issue is terrible to, but quite different. If NASA or G4S needs to lay off Firemen because of lack of work....that is one thing. However, that is not the case here. NASA chose to go from 75 Fire Fighters the day the shuttle flew out to 109 Fire Fighters. Why? We don't really understand either. They say it's because they are beefing up our response times and want to have more coverage. That doesn't sound like an agency that can't afford it's workers. It sounds like a company that wants more firemen, but can't pay for it. So, what do you do......take from the ones who are already there and try and fund the rest. We are accepting of change and have no problem with paying our fair share. including escalations is many areas, just as others out there have done. But don't promise me a retirement, ask for more service and the pull my life savings out from under me at the very time in which I may need it. The Fire Fighters and I are sympathetic to your issue and wish you the best. I understand what you are going thru and hope it all works out. But it doesn't take away from the fact that these Fire Fighters STILL train every day to protect the lives of thousands but are expected to take less for doing so.